The 2015-2016 Intel IT Annual Performance Report highlights technology trends driving rapid innovation across our enterprise. This edition showcases how Intel IT capitalizes on new technology to create business value and become a catalyst for organizational transformation. Aligning to business goals, Intel IT delivers operational excellence and provides thought leadership on strategic decisions ...and investment plans to achieve desired business goals. 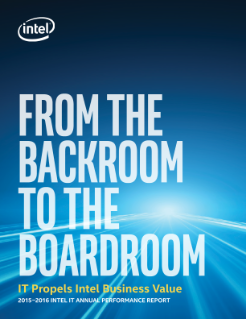 Intel IT brings a valuable conversation to the boardroom about how IT investments in productivity, digital transformation, and cybersecurity enable us to stay ahead of disruption while continuing our market leadership. Intel IT puts forth innovative solutions that elevate productivity in ways that are easy, secure, and wireless. Through advances in conferencing capabilities, and collaborative product validation and testing solutions, Intel IT has earned the trust of the business by delivering capabilities that remove barriers to achieving strategic business goals. In response to the continual pressure for faster time-to-market, Intel IT makes investments in multiple big data analytics technologies to drive an integrated, cost-effective approach to business intelligence (BI). Digital transformation is a priority as we continue to evolve how we gather, ingest, transform, compute, and render data to advance our ability to sense and respond to market needs. As security threats increase at an exponential rate across all industries, Intel IT protects our enterprise with a trusted security architecture to detect threats and correct potential vulnerabilities. Intel IT is making ongoing investments in monitoring, threat intelligence, end user training, and proactive threat response to improve resiliency in today’s insecure cyber world.